CoinOpCollectorForum.com • View topic - Beromat Payout mechanism: how does it work? Beromat Payout mechanism: how does it work? 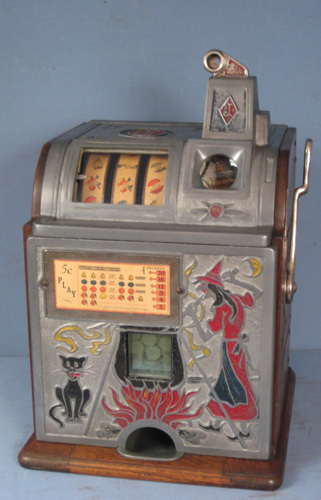 I’ve seen various pictures of the Beromat one arm bandit slot machine. The internal mechanism looks quite simple compared with most others. There are no Payout discs next to the reels like on Jennings etc. How does a winning line get a payout on the Beromat? I’m interested because I’m considering building my own slot machine and the Beromat mechanism seems quite simple. Re: Beromat Payout mechanism: how does it work? Find attached some information on the Gunter Wolff Beromat models, The Beromat was the only machine in the series that was built in two models, the Beromat and the Beromat "B" and was the only model made with both Fruit Symbols and Number Symbols, the payout controls are on each seperate reel, see mechanism breakdown, also a PDF file from my book, the trade show picture is of my late mother on our booth at the London trade show in 1960, my late father was the first man in the World to import these used machines from Germany in 1958, Great mechanisms.